As we pause to observe Thanksgiving Day 2018 here in the United States, I am reminded of the centrality of gratitude in ensuring that we keep all things in perspective and remain wholly present to God regardless of our circumstances. Writing to the Christians in Philippi, the apostle Paul urges, “Don’t worry about anything; instead, pray about everything. Tell God what you need, and thank him for all he has done. Then you will experience God’s peace, which exceeds anything we can understand. His peace will guard your hearts and minds as you live in Christ Jesus.” (Philippians 4:6-7). On June 28, 1773, John Wesley wrote in his journal, “I am 73 and far abler to preach than when I was three and twenty. What natural means has God used to produce so wonderful an effect?” As Wesley concluded his entry, he observed, “May I add lastly, evenness of temper? I feel and grieve, but by the grace of God, I fret at nothing.” One wonders how brother John would navigate the days in which we find ourselves. We move inexorably toward the special General Conference in February 2019. Uncertainty is the norm. Stress multiplies. Many are concerned about the future. Yes, there is much uncertainty for the people called Methodists as we move toward our next gathering in St. Louis, but our response must be to hold more resolutely to the One who never changes. Give no quarter to anxiety and worry. Instead commit yourself and your circumstances to Jesus the Christ. Let him know your great need. Observe the ways in which he is already at work in your circumstances responding to your intercession. Thank him for all he is already doing to establish his ways. As we pause this Thanksgiving, I am grateful for the certainty that God hears our prayers, that he loves his church, and that he is at work even now to advance his kingdom. I am confident in our future because Jesus has declared that he will build his church and the gates of hell will not prevail against it. I give thanks for your steadfastness to the ministry to which God has called you. I am encouraged by the boldness of your faith, your resolve to remain true to God’s word, and your standing unashamed for the Gospel. We cannot know the future with certainty, but we do know the God who is sovereign over that future and we see the evidence of his working to ensure that that future accords with his good and perfect will. 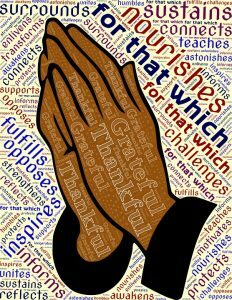 As you pause to give thanks to God for who he is and for what he is accomplishing, may you experience the fulness of his peace – a peace which is greater than we can understand. May his peace guard your heart and mind as you live in Christ Jesus. Happy Thanksgiving! Keith Boyette is president of the Wesleyan Covenant Association and an elder in the Virginia Conference of The United Methodist Church.